Grand Theft Auto: Advance is a criminal adventure game developed by Digital Eclipse and published by Rockstar Games. It was released on October 26, 2004 for the Game Boy Advance. 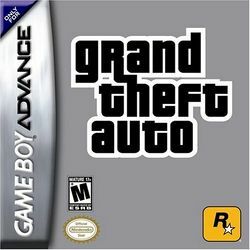 GTA: Advance mixes the same top-down perspective of the first two games with the gameplay elements introduced in Grand Theft Auto III. You play as Mike, a small-time criminal and partner of Vinnie, a more reputable and connected criminal. Together they made a fortune and were ready to leave Liberty City and retire from their life of crime in another country. However, Vinnie convinces Mike to carry out a few more jobs before leaving Liberty. But, as fate would have it, Vinnie is killed by a car bomb as they were leaving the city. Now, framed for his murder, Mike must avoid the cops and gangsters while trying to uncover the truth—and the killer. This page was last edited on 10 February 2016, at 16:39.